Recently at my dentist's office I told one of the assistants that she looked great. Her skin glowed, her hair bounced and her body looked lean and firm. "Thanks. I'm killing myself doing that P90X program," she said. Oh. P90X. In case you haven't heard of it, it's an intensive (some think masochistic) home exercise program that relies on cross-training: a mix of cardio, strength training, yoga, and stretching. As for the diet, it's high protein and low-to-no carbs. Think skinless chicken and egg whites. If you even fantasize about pasta or potatoes, you need to drop and do 50 push-ups. The assistant added, "You should see my husband though. He has lost 12 pounds in two weeks. He looks amazing!" "He's doing the P90X too?" I asked. "No. He's on the soup diet," she said. "What's the soup diet?" I asked. "Every Sunday I make a big batch of turkey and veggie soup to bring for lunch. My husband has been eating the soup instead of going out to lunch, and the weight has fallen off! So now he tells everybody he's on the soup diet," she said. Hmmm. Exercise torture or soup. Which will it be? Well, that's for you to decide. Personally, I like to exercise moderately every day and eat soup. And I not only fantasize about potatoes, I eat them too, roasted and dipped liberally in ketchup. But I have to agree to that soup, whether or not you call it a "diet," does help you lose weight. Broth-based, low-fat soups, chock-full of veggies help fill you up without packing on the calories. Indeed, studies have shown that people who eat 1 1/2-2 cups of vegetable soup before a meal, consume 135 fewer calories at the meal. Whether or not it's to keep your New Year's resolution to lose weight, remember these healthy tips when making soups: Opt for low-sodium broth-based soups instead of fattier cream-based ones. Add lots of nutritious and water-dense veggies such as leafy greens and winter squash. Make fiber-rich soups with beans which you'll digest more slowly. Boost flavor with fresh herbs and bold spices instead of salt or cheese. Choose lean protein such as chicken, turkey and tofu. 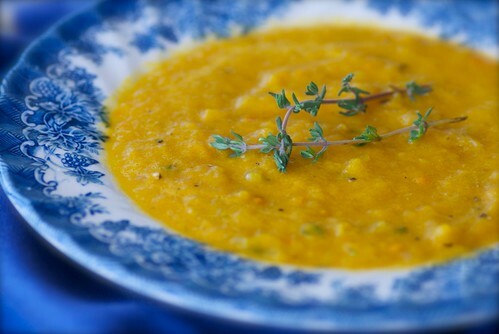 This Roasted Yellow Bell Pepper and Thyme Soup is wonderful in many ways: it's broth-based, low in sodium and high in fiber and beneficial vitamins. The main flavor enhancer is fresh thyme, a robust, earthy, aromatic herb that is especially delicious in soups and stews. It's strong, so be sure to taste as you go. And if you choose to use dried thyme, use less, as the flavor is more concentrated. Now, let's eat some soup and lose some weight because I really don't want to see you looking like that woman above. It's just too sad. If you decide to use bottled roasted peppers, then you'll need about 4 cups worth. 1. Pre-heat oven broiler. Line one large or two small rimmed baking sheets with aluminum foil. Slice peppers in half. Clean out the seeds. Place cut-side down on prepared baking sheet. Drizzle with 2 tablespoons olive oil. Place directly under broiler for 25-30 minutes until peppers are covered with black blisters. Remove from oven and wrap tightly in aluminum foil, or place inside of a paper bag and close tightly. Place inside of a bowl to catch any juices that might spill out. Let sit for 10-15 minutes. The steam will help the skins peel off more easily. Remove one pepper at a time. Using a paper towel, rub the skins off and discard. If you have trouble removing the skins, then steam the peppers a bit longer. 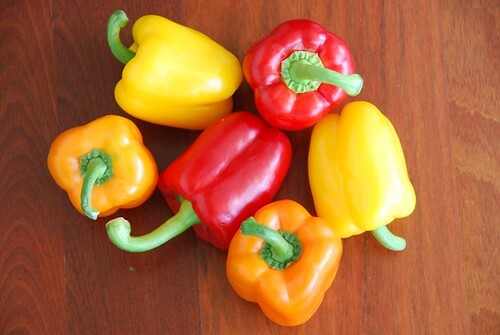 Chop peppers. 2. In a large, deep pot over medium-high, warm remaining 1 tablespoon olive oil. Saute onions, carrots, and celery for 5-7 minutes until lightly browned. Add roasted peppers and sherry vinegar and stir. Add vegetable broth, salt, and pepper, and cook 8-10 minutes. Remove from heat, and stir in thyme. Allow to cool completely before pureeing. 3. Puree the soup in batches in a blender until smooth, or if you prefer, a little chunky. Taste it. Season with salt and pepper to taste. Return soup to pot and heat on stove top for 7-10 minutes before serving. Garnish with fresh thyme, if desired. Don't forget to check out this post from earlier in the week: How To Keep Your New Year's Resolution to Lose Weight: Eat Breakfast. Wow - what an easy choice. Exercise or soup. Who wouldn't chose soup? Your photos are gorgeous and we do love soup at our house. I have really come around to soup lately and, quite frankly...I'd much rather be on a diet that allowed me to eat rather than restricted my eating abilities. Plus carbs and I have a very special relationship. I could never give them up. I've never seen a soup made out of a yellow bell pepper before but this looks wonderful! I think I'm looking at dinner. I love this post and your blog :) I just tried one video from the P90X series borrowed from my sister. Let's just say I was having a hard time lowering myself & getting up out of my desk chair the next day!! The soup idea is fab-u-lous! But first I need to try your better than IHOP pancakes!! I vote for soup, and a brisk in the morning. I can't say I've lost any weight, but I wouldn't say I'm gaining, either. I dont get as much exercise as i want to but the soup/veggie diet would work for me. I do love soup -- now I have yet another (good) excuse to make and eat it. I love the soup diet. Now this dosent look that painful…sounds downright delish in fact! Thanks for all the tasty comments, everybody! I'm so happy you like the soup and the philosophy! oh that soup looks sooo divine! lovely and great for a cold day like we're having.